THE BEAUTIFUL WILDERNESS Sometimes you need to get off the beaten path to find a beautiful landscape to paint. Wake up early, hike deep into nature, and find your perfect spot. Some paintings sell for commissions, others you’ll keep for yourself, but you’re always going that extra mile to find inspiration. OBJECTIVE Over six days, players gain Renown by hiking to beautiful locations to paint landscapes, which they’ll later sell. 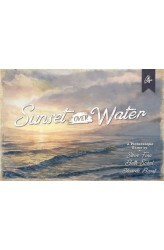 Each day, players choose a Planning Card, which allows them to travel through the Wilderness and paint (i.e., pick up Landscape Cards). At day’s end, they can sell paintings to earn Renown (i.e., turn in Landscape Cards to gain Commission cards worth Renown). Players also earn Renown by completing Daily Goals and by possessing Landscape Paintings at game..
You're working for the little flower shop in the heart of the village. To attract customers, you'll need to arrange the most beautiful display of flowers in the shop's window. 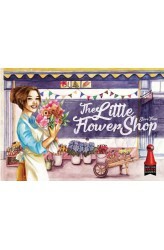 The Little Flower Shop is a light, yet strategic, set collection game featuring stunning artwork by botanical artist Sarah Wry. Mechanically, the game employs a familiar card drafting system of picking a card and passing the rest. The cards are then used according to their type. Vase cards are placed in a player's shop window. Flower cards are tucked under the vases, provided they meet the vase's requirements. Basket cards may be hung at the top of a player's window, but only if they can buy the baskets first. Salary cards provide free income. Sale cards allow players to sell flowers to put additional fun..